Race 8 of the 2017-18 Season and Final Heat of the Spring Point Score. Warm sunny weather with the prospect of a fresh NE breeze, ideal conditions for a big day of racing at the SFS. 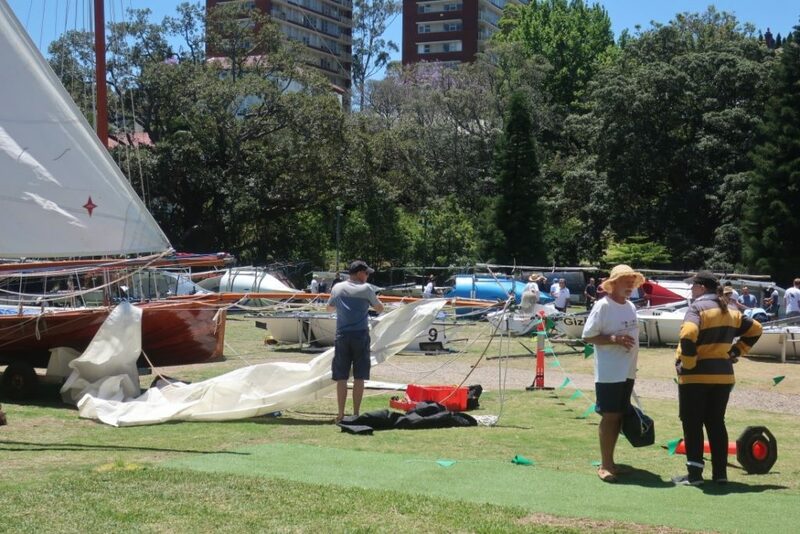 In addition to the Historic 18s the 12Ft Skiffs were running their NSW Championship over the weekend at the Squaddie. There were seven H18s and approximately 18-20 12s rigging in the boat park, a great sight, and a great day to be out following the action on the Rosman Ferry. The H18s race got underway from a handicap start off Double Bay on the No.1 NE course, with the 12s starting 30 mins later. Most skiffs rigged for fresh conditions; however, by start time the breeze still had a distinct easterly influence with a moderate ENE breeze prevailing. Britannia was first away off 13 mins, then Scot (10), Tangalooma, (9), Australia (6), The Mistake (4) then Myra Too and Yendys off scratch. The fine weather also meant that there were plenty of water craft out and about along with the many other sailing craft that race on Saturdays, making for plenty of joggle, boat wash and disturbed wind as the skiffs worked their way down to the Beashel Buoy. Britannia was first to round the Beashel Buoy for the run to Shark Island, followed by Scot, Tangalooma, Australia, The Mistake, Yendys and Myra Too. No position changes on the run to Shark Island, plenty of traffic sharing the same course area and then on approach to the gybe mark the easterly effect made for a very tight angle to keep crews on their toes in attempting to make the mark. Britannia led the way down to the Clark Island mark where they turned first for the beat up to Chowder Bay, while the order of skiffs that followed remained unchanged but now condensed. Scot moved into the lead on the beat up to Chowder to be first to round where they set a peak-head spinnaker for the tight run to Shark Island, followed by Britannia, Yendys, Tangalooma, The Mistake, Myra Too and Australia. Scot dropped their spinnaker at the Shark Island gybe mark, then reset their larger spinnaker for the run to the finish where they went on to take a comfortable win by 2 mins from Britannia (under ringtail), a 4 min gap back to Yendys, then Myra Too, Tangalooma, The Mistake and Australia. 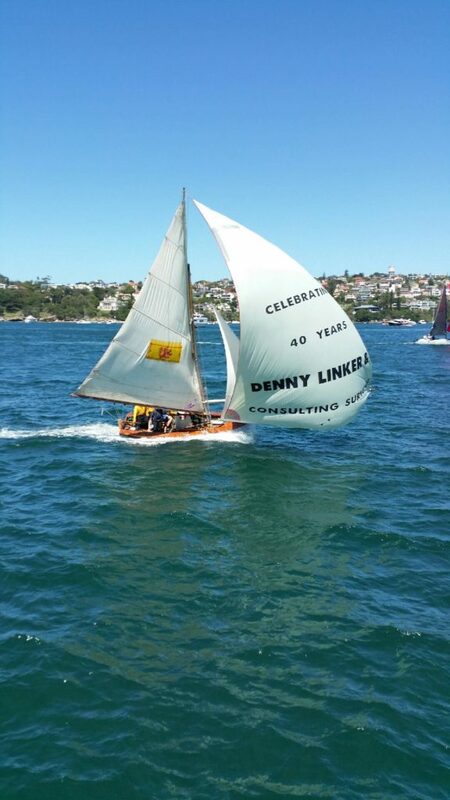 The Spring Point Score has been run and won, congratulations to Terry Stewart and the crew of The Mistake. The 3 skiffs that were shipped to the U.S. event are expected back in action next weekend. The next race is Heat One of the Summer Point Score and also Race One of the Season Point Score, with all skiff handicaps reverting back to the status quo as per the start of the season. With thanks to our on-water support team of Barley, Stu, Russell, Roy, Peter, Adrienne, Chuck, Bill, Janis and Bill, post-race support from Bill, Angove Wines and the rest of our tireless volunteers, along with the dedicated team at Rosman Ferries. We look forward to seeing you down at the Squaddie next week.